How many species should there be? 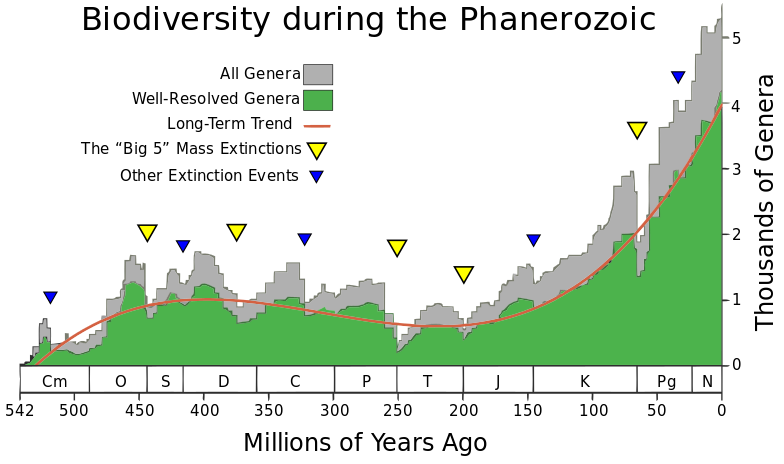 In any given environment, even with no change in the environment, natural selection will see to it, given enough time, that the number of species will increase to fill the available space. Competition between species will increase with increasing biodiversity. Species incapable of coping with the competition will restrict themselves to protected niches or disappear. As environment changes, modifications will also follow. As environment changes, species which were once viable may become extinct, continue in a suitable niche or adapt. As far as we know the earth is the only planet on which life has developed. Time and the laws of the Universe were established soon after the Big Bang singularity occurred some 13.8 billion years ago. The purpose of the Big Bang was to balance the Big Imbalance that had been created by Magic. The earth itself was formed when it congealed about 4.54 billion years ago. The Big Bang was by then long in the past and the earth followed the laws of the universe. The sun provided a source of energy. Chemistry between atoms and molecules happened. About a billion years later chemistry became biochemistry. Somehow RNA molecules (the RNA world) appeared. Some of these were replicating molecules. Some of these arranged themselves into single celled organisms. Single celled life began. Around 500 million years ago, complex multi-cellular life took off. In the 500 million years since there have been at least 10 major extinctions and 5 Great Mass Extinctions. The last one was around 50 million years ago when the large dinosaurs “disappeared” (though that disappearance may have taken many thousands, or even hundreds of thousands, of years). Nevertheless it was the spaces left vacant in the environment which enabled, and were filled by, the mammals and in turn the primates and humans. 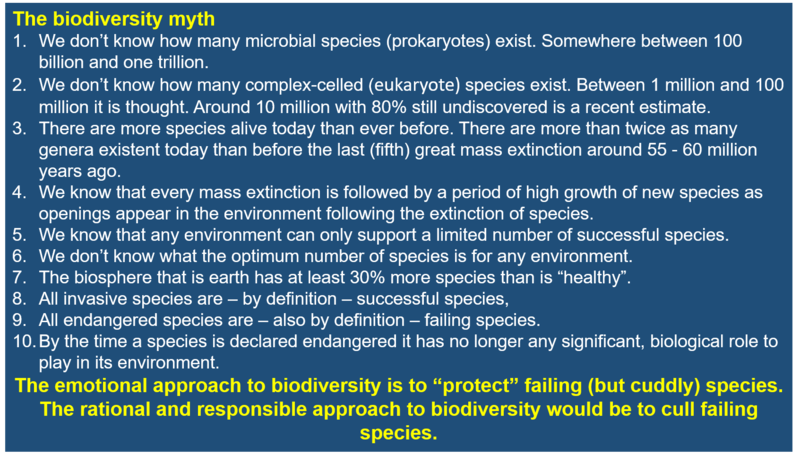 We don’t know how many microbial species (prokaryotes) exist. Somewhere between 100 billion and one trillion. We don’t know how many complex-celled (eukaryote) species exist. Between 1 million and 100 million it is thought. Around 10 million and with 80% still undiscovered are recent estimates. There are more species alive today than ever before. There are more than twice as many genera existent today than before the last (fifth) great mass extinction around 55 – 60 million years ago. We know that every mass extinction is followed by a period of high growth of new species as openings appear in the environment following the extinction of species. We know that any environment can only support a limited number of successful species. We don’t know what the optimum number of species is for any environment. The biosphere that is earth has at least 30% more species than is “healthy”. All endangered species are – also by definition – failing species. By the time a species is declared endangered it has no longer any significant, biological role to play in its environment. There was no biodiversity to begin with. Biodiversity is a result, not a goal. “Protecting” failed, but somehow attractive, species is entirely an emotional response by humans but it has no rational purpose. The rational and responsible approach to biodiversity would be to cull failing species. This entry was posted on August 4, 2018 at 10:25 am and is filed under Biodiversity. You can follow any responses to this entry through the RSS 2.0 feed. Both comments and pings are currently closed.